Frugal websites always tell you to cut stuff out of your life to save money. They want you to stop getting that morning latté. They tell you to give up restaurant meals or new clothing. And while cutting those things from your budget does help you save, they don’t do a whole lot to improve your quality of life. I’ve been doing this frugal thing long enough to know that you don’t have to cut out all the fun stuff to be frugal. 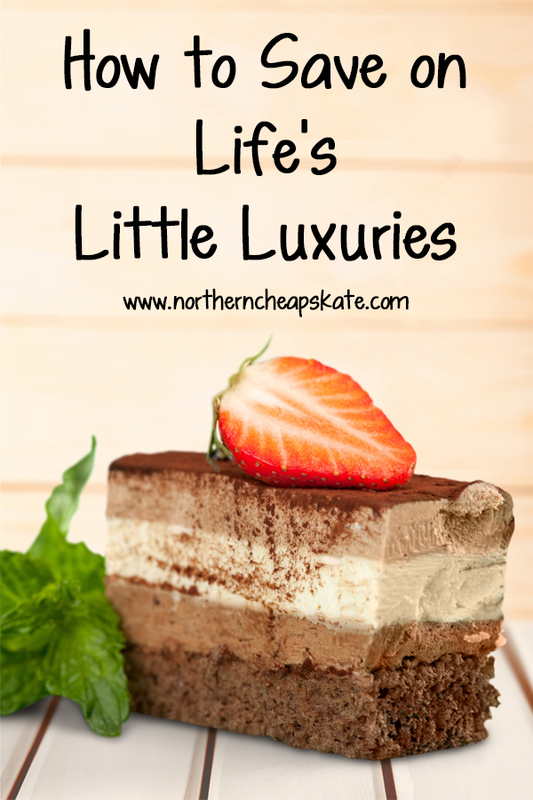 There are plenty of ways to enjoy life’s little luxuries for less. Here are some ideas on how you can “treat yo’ self” without breaking the bank. High end beauty products can really add up. Learn how to make your own beauty products at home (just do a search on Pinterest!) or stock up on beauty products when you find a great sale. You can learn to make your own hair care products, too. If DIY isn’t your thing, you can combine coupons, sales and shopping reward programs at places like Walgreens and CVS to get what you need to feel beautiful for less. Consider making your next appointment for a haircut, manicure, or pedicure at a beauty school. You’ll be providing students with a learning experience in exchange for a reduction in the cost. Boredom is a BIG budget killer. It causes us to spend all kinds of money on things we don’t really need. Some of my favorite ways to save on entertainment include using the library, finding free music to download, scoring deals on magazines, discovering places to find free books online, and watching movies on the cheap. Check your local community for free or low-cost entertainment. When you have lots of free things to do, you’d won’t feel deprived of any fun. One of my favorite treats is eating out, but it can get very expensive. Consider going to your favorite restaurant for lunch instead of dinner. Look for discounts on Restaurant.com, Groupon or Living Social. Find places where kids eat free. Earn some free gift cards to your favorite restaurants from Swagbucks. Use apps like ShopKick or Receipt Hog to earn gift cards to Starbucks. If dining out less is your strategy, you can still splurge a little on quality ingredients and cook gourmet meals at home. Invite friends over for a potluck and share the savings. Travel is another thing that can be expensive, but if you plan carefully you can save money. For example, you may find it more economical to take the train instead of fly, rent someone else’s home through a service like Airbnb or vrbo.com or take a short road trip closer to home. If you’ve got the gear, you can find free or cheap places to camp. I’ve known friends who’ve made house swaps with friends and family to experience new locales without pricey hotel stays. Your family museum membership could also help you save at other museums all over the country. The right outfit can make us feel like a million bucks. But it doesn’t have to cost much. Take advantage of the end-of-the-summer clearance sales to save on clothing. Visit your favorite thrift shops and consignment shops to find deals on secondhand name brand clothing. Another cheap trick? Hold a clothing swap with your friends. You’ll have a fun social gathering and everyone leaves with something new to wear. This is how I view my journey in frugality. Saving money is not about depriving yourself. It’s about finding different, less expensive ways to get the things you want in life. When you can do that, the savings you reap help you reach even bigger goals. That’s what frugality should be all about.